Sometimes you just have to go with your heart. I’ve been so taken with the book I recently acquired, ‘Memories of Old Walsall Wood’ by Bill Mayo and John Sale, that I just had to raid it yet again for some of the excellent pictures it contains. I love The Wood; it still retains its village atmosphere long after it became joined to Brownhills by development, and this charming, leafy place still hums with activity on weekdays. ‘Memories of Old Walsall Wood’ was very hard to obtain, but is a fascinating evocation of times past. Sometimes, you can’t really theme a feature, so I just thought I’d pull some interesting pictures out into the light that may trigger a few memories or queries. I pay tribute to the authors, and thank them for their work to preserve our history. I can't imagine trams rattling down the High Street, but it's stunning to see just how many of these buildings remain. This is a lovely image. I wonder if David Yates is still around? It conjours up the passing of an age, and of a slightly more rural Walsall Wood. Anyone know why this bridge - still present at the bottom end of Vigo Road - was so called? I'm interested in the background of this one, because I can't make sense of it. There's the pithead and slag heap of Walsall Wood Pit in the background of the lower picture, so the photographer must be facing north, with what would become Oak Park's football field in the middleground. What's the house? Not noticed that recorded anywhere. Who lived there? When was it demolished? I geuss it would be around about where the derelict groundsmen's compound is now? It took me a while to work this one out. The train is legendary - I have a couple of mates who swear they travelled on it - looks to be heading north toward Clayhanger. The bridge under the Lichfield Road is in the background, old station building to the left of shot; that house must have been Claytons, where the newsagents was in the eighties. Nice to see that train enthusiats don't change much... that pose with the jacket behind the back can be seen on platforms accross the country daily. 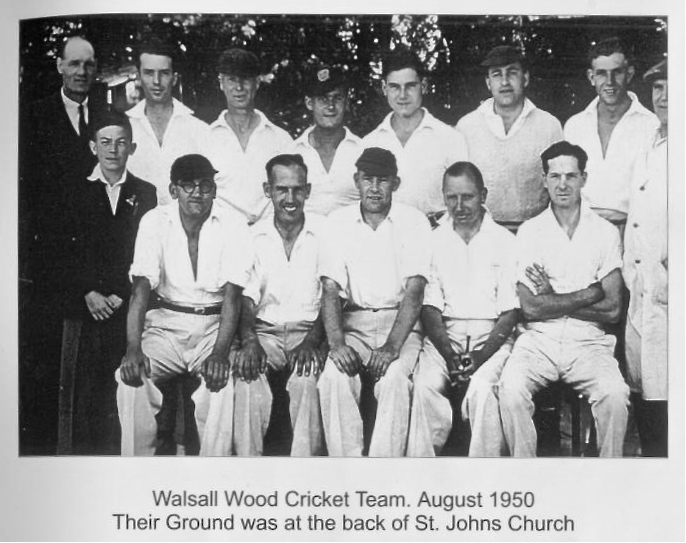 Walsall Wood Cricket Club was behind the Church, just between what is now Bridgewater Close and the High Street. I remember the railings and grass, but it was sadly lost in the eighties. Do you know any of these gentlemen? 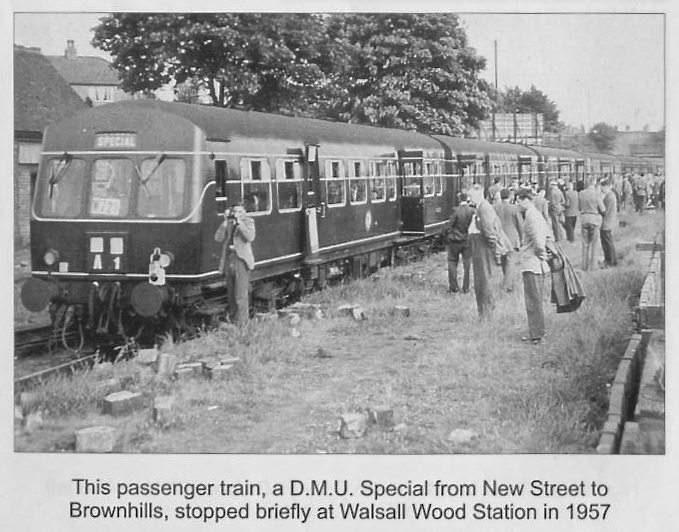 This entry was posted in Brownhills stuff, Followups, Interesting photos, Local History, Local media, Shared media, Shared memories, Spotted whilst browsing the web, Walsall community, Walsall Wood stuff and tagged Bill Mayo, Brownhills local history, Clayton, David Yates, DMU Special 1957, Ecob, John Sale, Local History, Memories of old Walsall Wood, Mr Faid, Mrs Barker, New Photos, Rabbit Bridge, Redevelopment, Staffordshire, Trams, Walsall Wood, Walsall Wood Cricket Ground, Walsall Wood School, Walsall Wood station, Whitehead chemist. Bookmark the permalink. Aeroflims produce good photos of the Wood, see click in time numbers 3015,3016,3017,taken when trams still ran..and on a Monday..you’ll see the evidence for yourselves!..One of these was shown at unveiling of artwork ceremony in St Johns church last year. Who owned the motorcycle in the school photo. Was it Killer? should read..behind Mr Maddocks’s house..I believe Orgill family lived in one of the houses there..Demolished in late 1950s or so.One such back to back can be seen in Black Country museum, opposite the old cinema. There was a house or houses right next to the school on the land which is now a grassed play area for the school children.l didn’t start at that school until 1961 and the house was definately there then.They kept chickens in the garden which backed onto the netted playground and l remember the horror of going to school one day and seeing blood and dead chickens all over the yard. 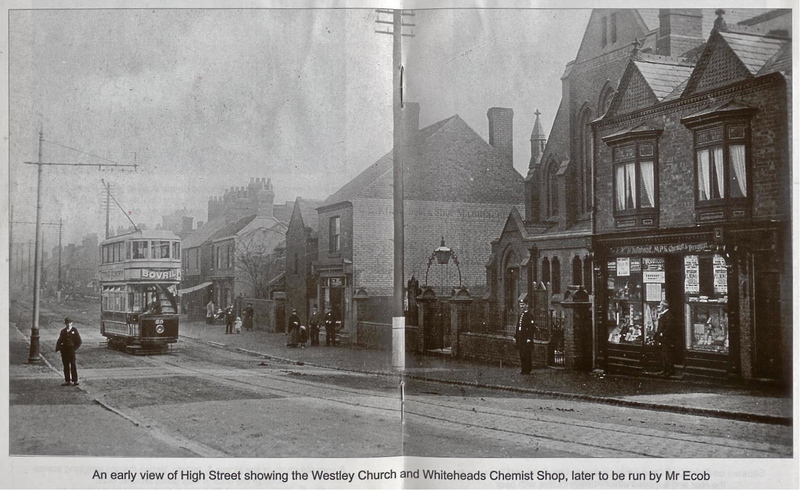 There was a shop in Brownhills Road,opposite the school.One of the terraced houses,l think. Sounds a bit scary that someone called “killer” should be riding a motorbike. Keep the old photos coming,they’re great to look at. my dad, Brian Downes, lived next door to the school in Walsall Wood, the hedge is still there that ran round his garden. can you remember the year/s he lived there.My later post is about my Dad living there between 1930 and 1934, aged 4 to 8/9.perhaps they knew each other or maybe they lived in the same cottage in the row but at different times? I also started at the school in 1961 after failing the “11 plus “exam. I cannot remember the house but remember the school gardening patch at the back of it. As new starters we had the job of turning over the soil. The gardening teacher, whose name I forget, was a wizened little gnome of a man who hung out in a prefab classroom a bit like a garden shed. I attended for just over a year when the family upped sticks and moved to deepest ,rural, South Shropshire. A culture shock to both sides. The house in the background of the station photo. Could this have been occupied by the Craddock family ? They owned a furniture removal company in the 50s/60s. l remember my dad telling me he lived in Brownhills road by the school as a youngster, so l’ve fished out his “lifestory” that he wrote shortly before he died. In it he wrote that his first memories are as a 4 year old  living in a little cottage next door to Walsall Wood school with his Mom Dad and sister.Just as D.Evans said, it was a row of 4 houses.His parents were William George and Emily Maud Edwards and as well as being a miner his Dad was caretaker for the Chapel in Lichfield Road. Apparently, there were very few houses about at that time,just the odd cottages dotted about and across the road from their house was a farm with a large orchard called “Lindons Farm”.He recalls they were a big family and Billy Lindon was a friend of his.He wonders if Lindon Road was later named after this family? Dad said the cottage was very cosy but had no mod cons, lighting was by gas as there was no electricity and his Mom did the cooking in a big oven set in the black leaded grate,which as D Evans said is just like those at the B.C.Museum.The house was heated throughout by a coal fire and the “allowance” coal was delivered, about once a month, by horse and cart. They lived there until 1934, when they moved to a cottage next door to Ebenezer Chapel,in Lichfield Road, Walsall Wood. Dad points out that this cottage was the same as the one by the school and still only had an “earth” toilet at the bottom of the garden.He describes it and you really don’t want to know where the ashes ended up on a windy day. We really are very lucky to have the comforts that we so take for granted today. By the way, he recalls the Headmistress of the school at that time was a Miss Watson. Caz might like to contact Simmonds Aerofilms,32 Station Close, Potters Bar,01707648390, to buy one of their pre-war aerial photos of the Wood. They show the old houses and the rest of the village. His father will have know Isaac Dunning very well, I expect, and the others at Ebenezer. 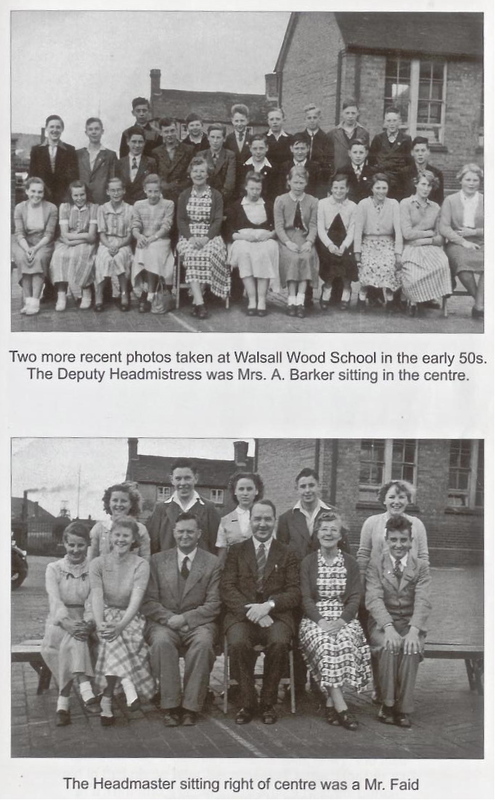 Mr Barker, husband of the lady in the photo, was headmaster at the Junior School. Oakparkrunner’s Walsall Wood Regeneration blog is interesting to look at, by the way. “Daddy”, “Doc” and “Killer” were alternative names, and therefore terms of affection, for some of the gentlemen teachers in the Secondary Modern School. Not quite Snow White’s little friends, but one of them did have a spade ! The real, original Shire Oak tree used to stand where Holly Lane met Lichfield Road.and was adjacent to Mr Morgan’s cottage..All since disappeared due to road widening ! I LIVED IN WALSALL WOOOD ON WALSALL ROAD WHEN I WAS YOUNGER NEXT TO THE OLD BOOT INN . I HAVE LOTS OF FOND MEMORIES OF WALSALL WOOD . LADS SWIMMING IN THE OLD CLAY HOLE AND CANAEL. WE DID NT HAVE A LOT BUT THOSE WAS HAPPY DAYS. I only discovered this site fairly recently so my comments are rather belated but I enjoyed reading the earlier discussion. In the cricket I think the third from the left is a Mr. Mills. Don’t remember his first name as there were three brothers, two of whom played cricket. Left front is Jack Harrop, while the young lad looks like Terence McCarthy who looked after the scoreboard. Hilda Hancox, who had three sons, Melvin, Maurice and Teddy. Mr Hamer taught at the school from the 1930’s. He was a vigorous, athletic man, took sport and P.E. as well as general teaching duties. He lived in Pelsall Lane, Rushall and played cricket fot either Rushall or Pelsall, He cycled to school on a bike which was distinctive for having a front carbon lamp, a type of lamp which was a virtual antique seventy years ago !. So, here I am again, writing on Mom’s behalf. Firstly, The shop opposite the school was Polly Wadies. Dixson shop was next to the Big gates to the opening of the park. Mom also knows some of the people on the school photo too. Hello, my dad graham cresswell who lives in walsall wood mentioned his father joseph cresswell had a cricket cup named after him presented every year by his wife mary. Would anyone have any information on who is the present holder of the cresswell cup? I would appreciate any leads of information. Thankyou. Tim Newton here – your old next door neighbour in Hall Lane – what did happen to Peter? graham cresswell lives at number 96 hall lane, did you know him? yes gillian is my sister, along with corrinne and lorraine! Sorry for not replying but I have only just read your comment. 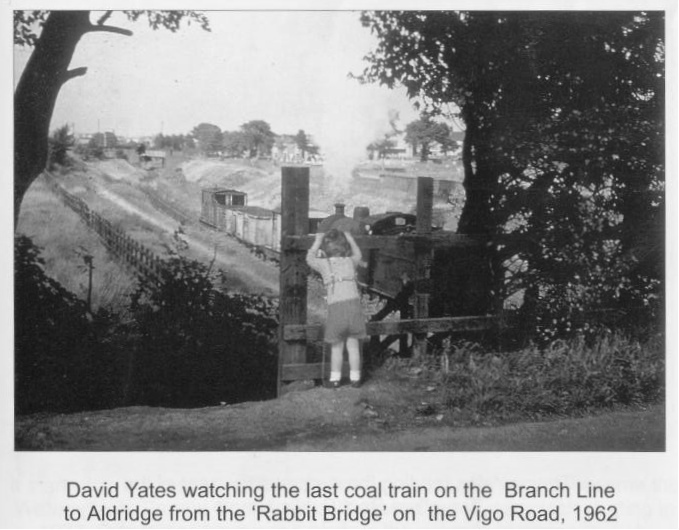 Hi I think the David Yates in the photo was the brother to my best friend Peter they lived in Prince street and his I remember David and his dad had a great train layout.. Lost touch when I left the village in 1975-76. Just Read this. Small world Dave Yates is one of my best friends. , he lives in Burntwood now . We still live in Hall Lane and Graham Creswell lives 3 doors away. and i am grahams daughter reading this… small world indeed!!! a test for Walsall Wood folk and a request…. Did anyone know a Dickie Poole. The name has cropped up several times in cups of tea and cake chats recently.